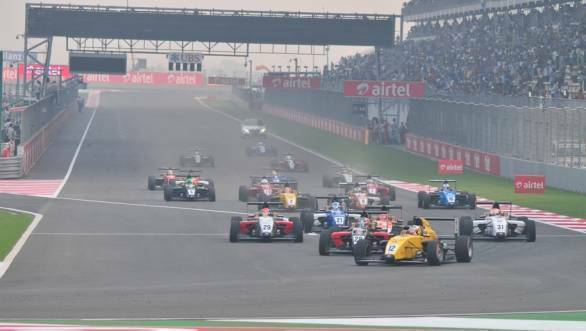 The Buddh International Circuit is all set to host the third round of the MRF Challenge 2016 between the 27th and 29th of January. Heading into the third round, it is Australian driver Joey Mawson who leads the championship, after both Harrison Newey and Mick Schumacher retired from races in the previous round in Dubai. Speaking ahead of the races, Arun Mammen, Managing Director of MRF Tyres, said, "We are thrilled to be back at the BIC as the championship begins to heat up. This circuit has always provided some great racing and this time will be no different. The F2000 has made leaps and bounds since we last visited here and we are confident that fans will witness the fastest cars racing on this circuit since the F1 cars back in 2013." The round is particularly crucial for Schumacher, who now trails championship leader Mawson by 39 points. Mawson currently has 141 points, with Newey on 113 points. But there will be competition from other quarters as well - 2015 Italian F4 Champion and F3 race winner Ralf Aron will be present, as will Japanese F3 Champion (National Class) Yoshiaki Katayama, as well as Manuel Maldonado. The first round of the MRF 1600 series will also take place this weekend. 12 drivers will take to the grid, headed by Anindith Reddy, who won the Volkswagen Vento Cup in 2015. Ishaan Dodhiwala, who claimed that title in 2016 will also compete, as will Nayan Chatterjee, Ananth Shanmugam and Angad Singh Matharoo.